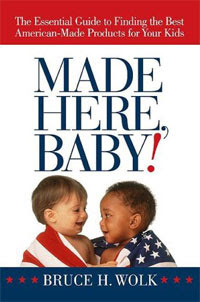 "Made in the U.S.A." - When looking at children's products and toys, those words are kind of hard to find. In fact, I bet if you look at the toys littering your floor or check out the tags on your child's clothes, you won't come across that phrase very often. Made Here, Baby! : The Essential Guide to Finding the Best American-Made Products for Your Kids is a well-timed book that lists over 400 American companies that make children's products. The book aims to educate parent, grandparents and all those who buy for kids about the manufacturers (both big and small) that produce quality, American-made products. Given all the recalls lately and news about toxic, lead-laden toys, it makes sense to spend a little more time paying attention to all those purchases for kids. Add that to the news of economic woes and recent company closures, it makes even more sense to exercise some patriotic spending and buy American. Made Here, Baby! increased my awareness of the U.S. companies that manufacture all sorts of products for kids. A superb printed resource, it organizes American-made products into five categories: products for infants, children's clothing and accessories, children's furniture, sports and fitness equipment and toys and games. The company listings are detailed and include interesting facts and contact information. The index even lists the manufacturers by state (though I wish page information was included in this section). The author Bruce Wolk has done all the background checks, tirelessly researching the companies and compiling them into a useful book. His close ties to and compassion for American manufacturing is evident in the pages of Made Here, Baby. He states that no company has paid for mention in his book, a big plus for consumers. I noticed several familiar companies mentioned in the book including Louisville Slugger, Step2, K'nex, Big Wheel, and Britax USA. We own a Britax carseat, and I didn't realize it was American-made until reading Made Here, Baby! I happily found a few companies I've mentioned on my blog listed in the book as well: Lindenwood, Inc (maker of Uncle Goose blocks) and Northstar Toys. I highly recommended this resource for finding American-made children's products. Thanks to Family Review Network and AMACOM for this review opportunity! Great review! As I've been reading all the reviews for this campaign, it has struck me that not only is this book a fantastic resource for parents, but it could also be a great reference for bloggers who are interested in featuring American-made companies on their blogs. Thank you for the kindness of reviewing my book. As you correctly pointed out, there was a lot of fact finding and research. The amazing part (to me at least)was that every time I had allowed myself to get discouraged at the enormity of the task, one of the American manufacturers would reach out to me and tell me that what I was doing was valuable. In some of my materials, it says that "I started my career on the manufacturing floor." What does that mean? It means that I was literally mixing batches, working the production line, loading trucks, and lugging pallets sacks of ingredients. I was most fortunate in that I listened to people with my hands and heart, not just with my head. I understand what it is like to make something, and the pride that goes into putting in a day's labor. The more I worked on Made Here, Baby!, the more I felt at home in writing about all of these incredibly, courageous people. I, as an author, am a very minor character; the real heroes are the people who are slugging it out every day against the imports. I will always think of these companies as my friends.